1931 Gustave Lund E.H. Carlstedt . 1932 E.W. Magnusson E.H. Carlstedt . 1933 L.E. Cooper E.H. Carlstedt . 1934 L.E. Cooper Carl Lund . 1935 Ramon Bowers Carl Lund . 1936 Ramon Bowers Carl Lund . 1937 Ramon Bowers Carl A Swanson . 1938 Ramon Bowers Franz Romeis . Ramon Bowers was a Scoutmaster during the 1930's who created a strong program despite little money available during the lean years of the depression. He built Troop 33 into the first fully uniformed troop in DeKalb County, a very difficult feat given the times. He was active in Troop 33 over a 10 year period, serving as Scoutmaster 1935-1940 and then became Scoutmaster again in 1944. Ramon served as Scoutmaster until his death in 1944. 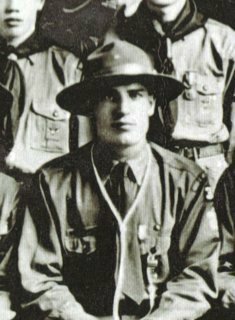 Harold Snow was a legendary Scoutmaster who had created a strong program over many years, building Troop 33 into the largest troop in the district. Even after his youngest son Bob graduated high school in 1968, Harold continued devoting huge amounts of time as Scoutmaster of Troop 33. He was a Scoutmaster's Scoutmaster. He hiked the trails of Philmont in 1970 at age 63. He also served in many district positions beyond the troop such as Scout Roundtable Commmissioner and Asst. District Commissioner and staffed many training programs. Both Harold Snow and his wife Aurel Snow were very active Scouters and both recipients of the Silver Beaver Award for distinguished service to youth. Harold also received the Lamb Award from the Lutheran Church for service to youth. Harold and Aurel had three sons, Richard, Steven, Robert, who became Eagle Scouts in Troop 33. Harold Snow was known affectionately as "Irish". 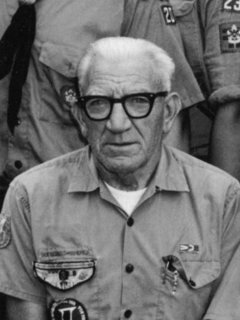 Harold "Irish" Snow died of a massive heart attack during a Scout campout in early June 1973 at age 66. He had just retired from his occupation the previous year. He died while doing something he truly loved, camping with his Scouts at Camp Rotary MacQueen. Warren Scott was the natural choice for Scoutmaster after Harold's death. It was Warren who went to Philmont with Harold, and was assisting Harold in taking the troop to the 1973 National Jamboree in Idaho. Warren worked to help the troop heal after the painful loss of Harold Snow. Warren also was very active in Cubbing, serving as Cub Scout Roundtable Commissioner. His leadership in the annual Cub'n'Family Picnic made it a highlight event of the year for Kishwaukee District. Warren was a recipient of the Silver Beaver Award. Warren retired as Scoutmaster due to some health concerns. 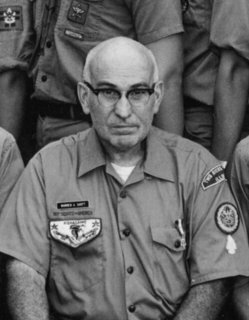 Elmer Williams worked with Troop 33 for 25 years, from 1954 until 1979, serving as a Committee Chairman and later Institutional Representative. He provided continuity and was involved in recruiting Harold Snow as Scoutmaster. 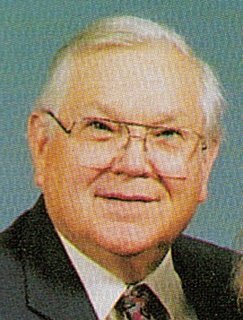 He was a very committed supporter of the Scouting program and active with Troop 33 until retirement took him away to Hawaii. Lou Bergren took over the reins of Committee Chairman from Elmer Williams. As a child growing up on a farm during the depression era Lou never had the opportunity to be a Scout. He sought that opportunity for his sons and worked tirelessly as an adult volunteer in Scouting for nearly 50 years, first with Cub Scout Pack 115, then with Troop 33 as Committee Chair, Troop Treasurer, and Institutional Representative. He worked behind the scenes to keep the troop running smoothly. He also worked at the district level at various positions including District FOS Chairman and Asst. District Commissioner. He is a recipient of the Silver Beaver Award for distinguished service to youth. Lou's five sons all had great Scouting opportunities in Troop 33. All five sons attended National and/or World Scout Jamborees and all five acheived the Eagle Scout Award. Though his youngest son graduated high school in 1977, Lou continued serving as Committe Chairman, and later Chartered Partner Representative and Treasurer for another 27 years until 2004. Cliff Golden joined Troop 33 at age 11. Harold Snow was his Scoutmaster. 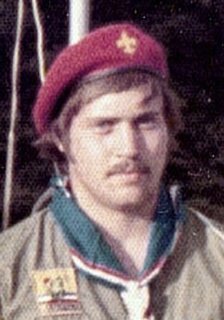 Cliff attended Philmont Scout Ranch as a Scout under the leadership of Harold Snow and Warren Scott. He attended Northern Ilinois University and lived at home helping the troop when he could. When Harold "Irish" Snow died in June 1973, Cliff stepped up to assist Warren Scott in taking the boys to the 1973 National Jamboree. When Scoutmaster Roger Hart moved away in October 1976, Cliff was asked to take his place. He intitially wasn't interested, but no one else could be found. He became Scoutmaster at age 22 to keep the troop going as a temporary measure. Cliff continues today serving as Scoutmaster of Troop 33. He especially loves high adventure programs, attending Philmont 9 times, among dozens of other adventures. He is a recipient of the Silver Beaver Award for distinguished service to youth and the Founders Award from the Order of the Arrow. During Scouting's centennial in 2010 he was selected to represent Three fires Council for the National Hall of Leadership. Over the years Cliff has served in various capacities including District Scout Rountable Commissioner, District Commissioner, Associate Lodge Advsor for Glikhikan 106, and Two Rivers Council Camping Commitee. Larry Aska began Scouting with Pack 131 eventually serving as Cubmaster. He became active with Troop 33 upon crossing over with his first son in 1992. Larry has spent over 10 years serving as Committee Chairman for Troop 33. He has helped improve our fundraising efforts and helped us greatly expand our equipment including a fleet of 8 trailers, two of which were custom designed and built by Larry. Larry has supported numerous high adventure trips, especially in our Iron Man bicycling program where Scouts ride across America. He is also instrumental in securing for us a donated warehouse for our large inventory of equipment. If you have any stories or photos to share about the history of Troop 33, please e-mail them to Troop 33's Scoutmaster, Cliff Golden, linked below.